It’s hard to believe it’s already August! 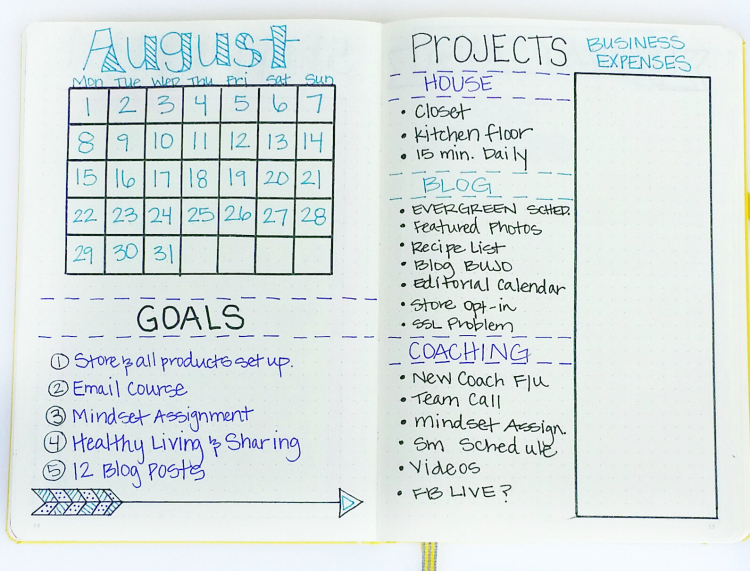 I feel like I just shared my July setup with you! 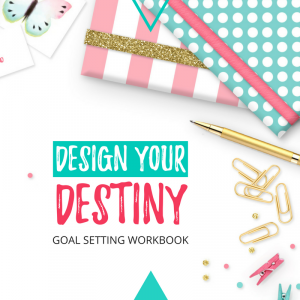 It’s really been helpful to share these Plan with Me posts. It gives me an opportunity to review the month as it’s ending, and figure out a plan for the month ahead. 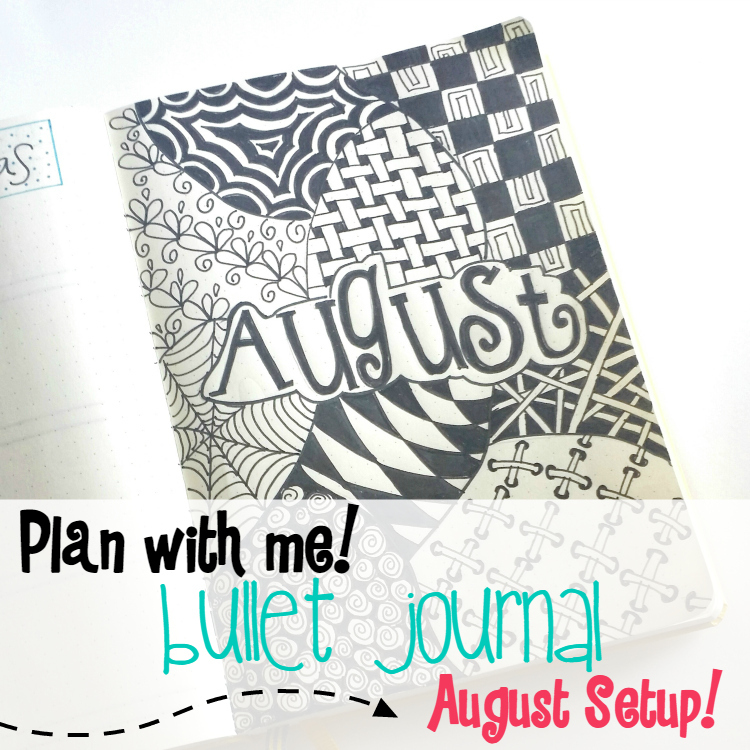 As I evaluated this last month, I felt the need for some simplicity, so when we get to my August Bullet Journal setup below, you’ll see that I’ve simplified a few things. I thought it would be fun to pick my favorite pages from July to share with you before we get to this month’s setup. Blank notebooks are my favorite thing! They hold so much undiscovered possibility, and you can’t have notebooks without pens and pencils, right? I love turtles because they are soft on the inside with a protective outer shell–just like me. I love to read. My goal is 100 books this year, and I’m about halfway there! My Meyers-Briggs personality type is INFJ. I’ve been told it’s the rarest type, and it describes me perfectly. I love productivity and to-do lists! I’ve always been a Utah girl. If you’d like to join in the fun, share 10 random facts about you using the hashtag #10randomfactsaboutme and make sure you tag me on IG (@bossgirlbujo) so I can learn more about you too! I really liked this “Currently Reading” page I added in July. As you can see, I read several books at a time, depending on my mood, so it’s nice to have this page to remind me which ones I have in progress and where I’m at in them. The boxes represent chapters, but one of my Instagram followers suggested making each box a certain number of pages. I like that idea too. I had a rough day this month, so decided to focus on self-care and took the day off. I shared this day’s layout on Instagram, and it must have resonated with a lot of people because it got a lot of comments. Apparently we all need to give ourselves a break!! 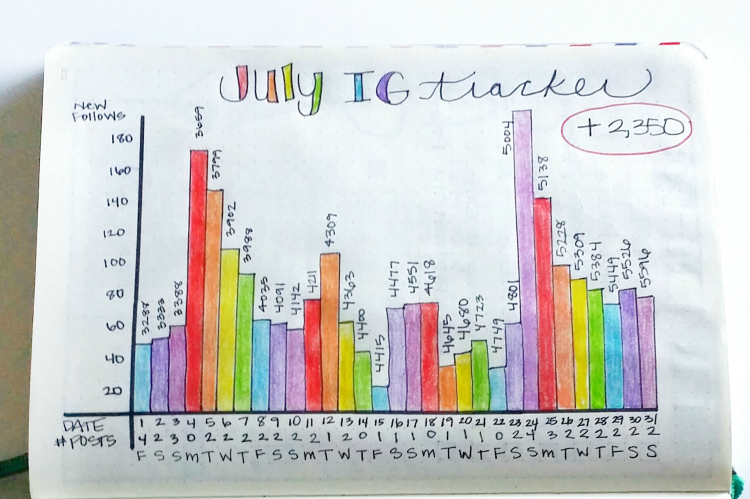 I used this Instagram tracker to track how many new followers I got each day. I was looking for a pattern based on days or the number of posts I shared. It was hard to identify a pattern, but it was kind of fun. I had 2,350 new followers in July which amazes me. 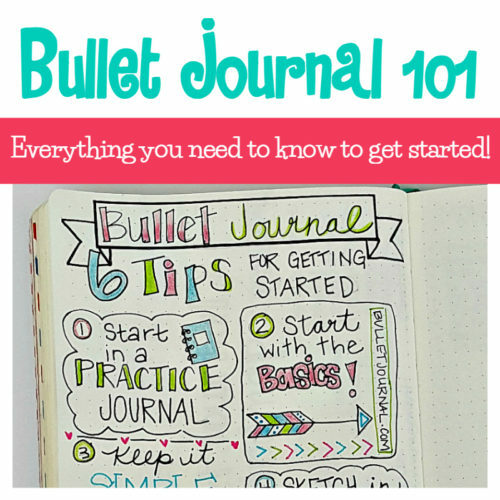 It’s been so fun to be part of the Bullet Journal community. I’ve met some really amazing people and I’m in awe of your creativity. Kim from Tiny Ray of Sunshine suggested Squarelovin to track analytics, so I just signed up, (it’s free!) and the analytics they provide are amazing. 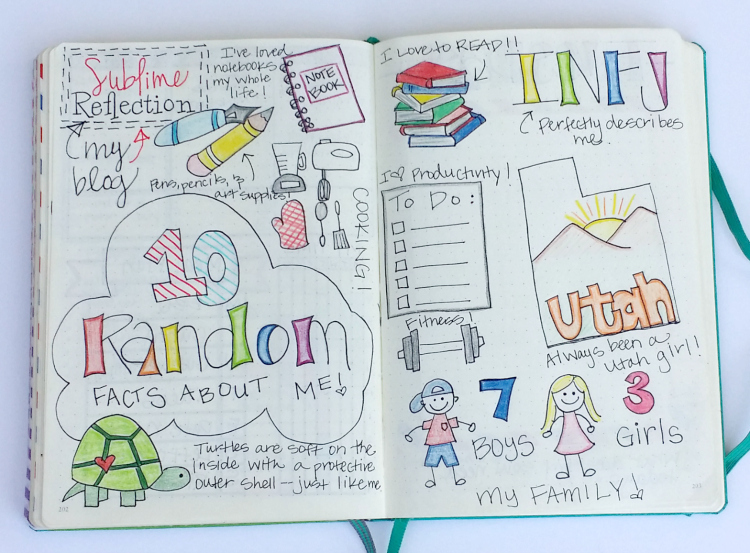 I see so many comments in the Bullet Journaling community from people who feel discouraged because they can’t make their pages “pretty.” I know that feeling because I felt the same way when I first started out. 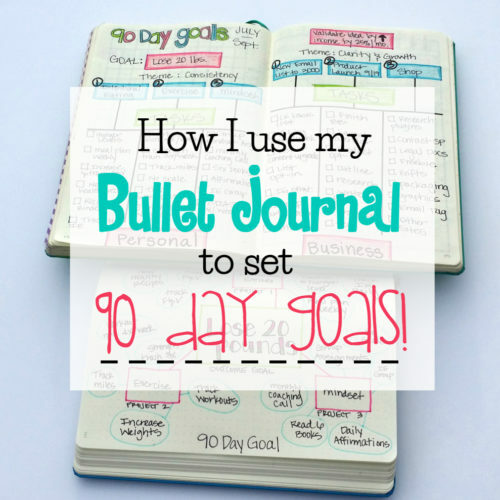 In fact, if you read some of my first Bullet Journal blog posts, you’ll see some of my early pages and see how much my style has changed in the 9 months I’ve been using a Bullet Journal. Anyway, I wanted to share some simpler layouts to encourage rather than discourage people who are new. I’m working on some big projects that I scheduled when setting my 90 day goals, so I want to focus on productivity to get them done. This means spending more time on the functionality of my Bullet Journal and less on the aesthetics. Don’t get me wrong, I still love a pretty page, and I enjoy spending some downtime working on them, so you’ll see a few creative things pop up, I’m sure. You’ll see I moved into a Yellow Leuchtturm. this month! I love that it’s bright and sunny! By the way, in case you haven’t heard, I opened up a new shop page where I’ll be carrying my favorite Bullet Journaling supplies. 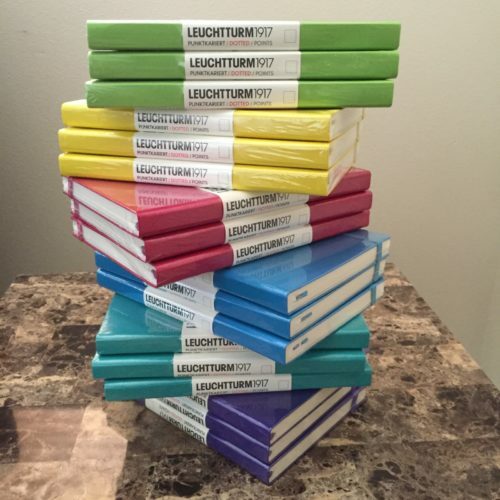 So far, I’ve listed Leuchtturm notebooks in my favorite colors. More fun things will be posted throughout the month. Throughout August, all products are 10% off and you can get an ADDITIONAL 15% off by joining my mailing list. See details on the Shop page. In July, I had a page to write down ideas or spreads I come across that I’d like to add, so I added a spot for page ideas in my new journal. I also like having a title page to separate my book into sections by month. 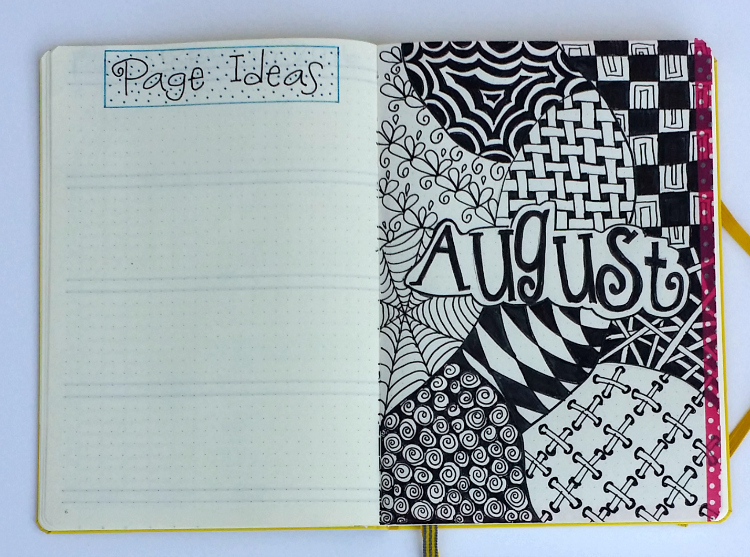 I always add washi tape to the edge of the first page of each month. It was fun doing some Zentangle this month. If you’re new to Zentangle, be sure to check out Tanglepatterns.com for lots of step-by-step ideas. I love Zentangle. It’s so easy anyone can do it, but your finished product ends up looking amazing. It was one of the first things that made me think I might actually be artistic. I don’t usually create a monthly spread. I don’t find it necessary because I have all my appointments in Google Calendar and just refer to that when creating my weekly spreads. But, I decided to do a monthly dashboard this month to get a big picture overview of the things I need to work on this month, and to focus my thoughts in an organized way. The following two pages are very plain, but super functional. 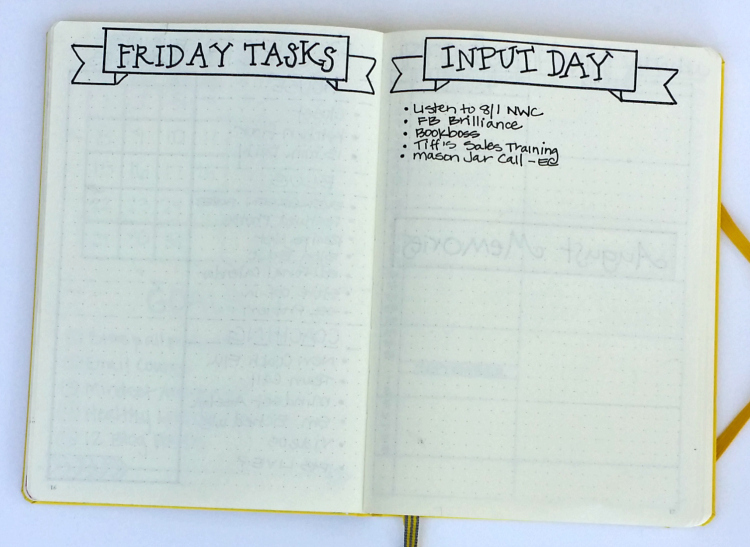 On the Friday Tasks page, I write down all the little tasks I’d like to do that don’t take very long, and aren’t absolutely necessary to do right now. These are things like looking up a website I heard about, checking to see if my library has a certain book, following up on an email, phone calls I need to make, etc. They are small tasks that don’t take up very much time, but if I stop in the middle of my work day to do them, it throws me completely off track and really affects my productivity. So instead, I write them on my Friday Tasks list and set aside an hour or two on my Friday schedule to work through them. It’s amazing how many little small things you can get done in an hour. As a creative entrepreneur, I could be constantly learning. In fact, it’s what I most love to do!! But as you know, there’s a constant stream of information coming at us from everywhere online. If I spend all of my time learning new things, I don’t spend time creating and moving my business forward. I consider Monday through Thursday my output days. They are the days I’m creating, writing blog posts, sharing on social media–putting my stuff out in the world. On Friday, after I do my hour of Friday Tasks (like mentioned above), I reserve the rest of the day as an input day. I watch things I’ve bookmarked throughout the week, read blog posts from my favorite bloggers, work on courses that I’ve purchased, listen to training calls, etc. It’s been really helpful to make a list of those things so that they don’t fall through the cracks. These next two are new experiments for me this month! I got this idea from Kris at Passion for Planning. She calls it her Life in Pixels. Cute, right? Each day I reflect on my day and color in whether it was amazing, great, average, difficult, or very tough. Those descriptive words work for me, but you can totally make up your own words that fit the way your mind works. At the end of each month I’m going to total up how many days I had of each. I think it will be eye opening and can’t wait to see! 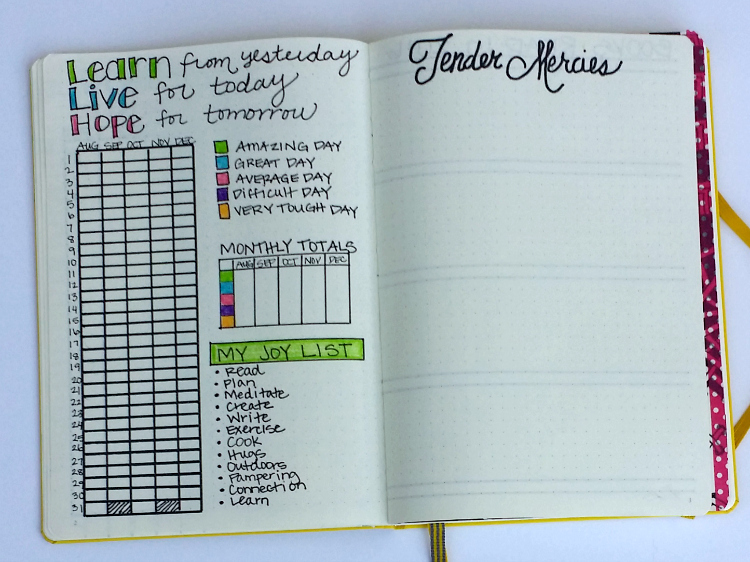 I also added a Joy List to the page, so I have some quick ideas for days when I’m feeling down. I want to focus more on recognizing God’s hand in my life, so I created this Tender Mercies page based on a quote I love, and I’m going to reflect each evening on how I saw God’s hand in my life that day. I’m not sure if this will be thoughts written down, doodles, or maybe both. This is my first weekly layout for August. 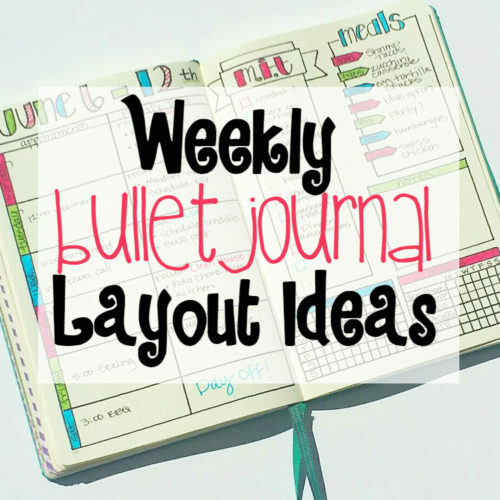 If you’ve been following me long, you know I love to experiment on my weekly layouts. This is another area where I’m simplifying this month. I made a simple calendar for scheduled appointments. I also assigned a specific focus area for each day. I’ve found if I focus on one area of my business each day instead of jumping around from one thing to another, I get a lot more done. It’s kind of an experiment, but seems to be working so far. I do spend about an hour in the morning and an hour at the end of my work day on other tasks such as social media posts, email, etc. 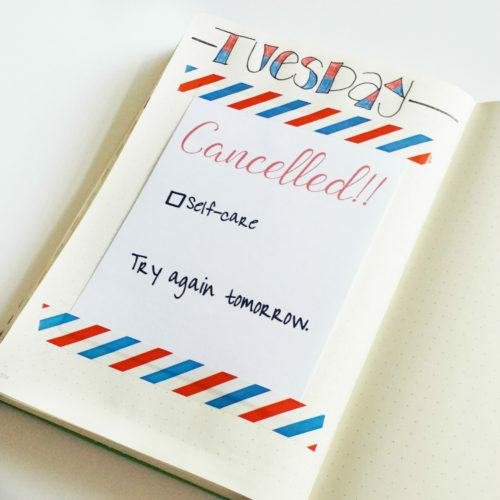 It’s been especially helpful to schedule and admin day to get to all those little business tasks that are so easy to put off! 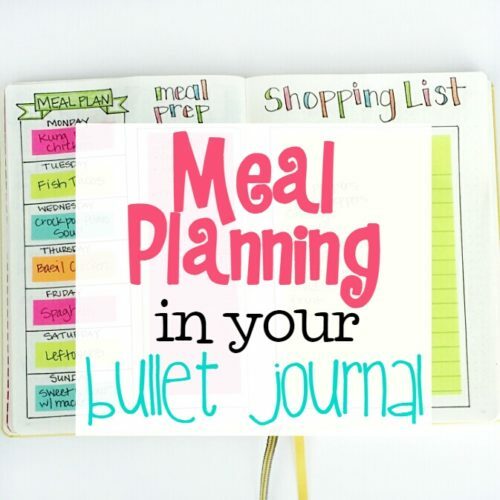 I’ll be sharing a lot more about how I use my Bullet Journal for my business, so if there’s something specific you’d like to hear about, let me know in the comments below. These are my first two daily pages this month. I don’t have a specific layout I follow for dailies. I just kind of do whatever I feel like that day. A few weeks ago, I started adding my top 3 priorities at the top of the page so they were separated from my task list. This has been helpful and I’ll definitely continue. I’m doing the Country Heat workout program this month, so I made some labels to track my nutrition. I think that’s going to help keep me motivated. Well, that’s it for this month! I’d love to hear from you. 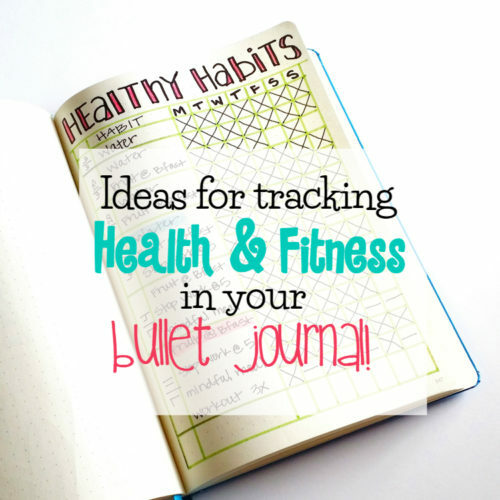 What are some new things you’re trying in your Bullet Journal for August. If you have any links to share, feel free to post them in the comments below. I’d love to check them out! Remember, if you’d like a 15% off coupon code for my Bullet Journal shop, sign up in the box below! They are selling out FAST though, so don’t wait. 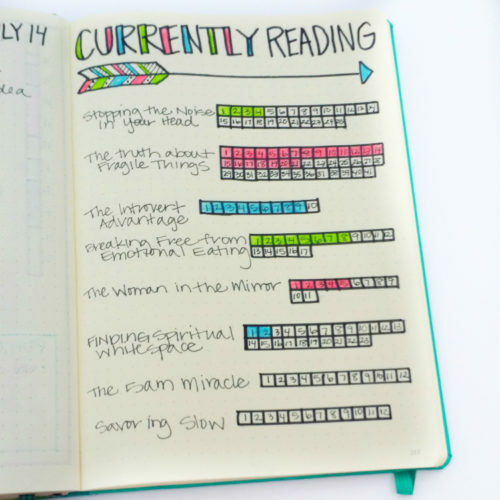 I’m loving your Bullet Journal posts. I’m pretty new to Bullet Journaling but I am definitely enjoying it and finding it helpful. I find August a weird month though because the kids are off school and we are back from our month-long stay at my parent’s place and my doctor’s appointments are minimal. All that will change in September though so I will probably start doing daily pages then – I haven’t found the need for them yet although I like the idea. I also love the idea of the Country Heat workout but I need to get stronger I think before I attempt it. Thanks for sharing! As always, I enjoyed your post & loved your layouts. I’m new to bullet journaling. I haven’t even really started. I’ve purchased some supplies and played around with a few layouts. Mine will definitely be more on the minimal side. I don’t have tine for creating fancy spreads and I’m afraid if I spend too much time getting the BuJo ready, I’ll stop using it. If it becomes too time consuming, it will defeat the wonderful purpose it serves. Plus, and this is a major contributing factor … I am the world’s worst artist. I simply can’t draw. NOT KIDDING or exaggerating. I can’t even draw a straight line or a circle without a ruler/protractor. And my illegible handwriting resembles a doctor’s scrawl. 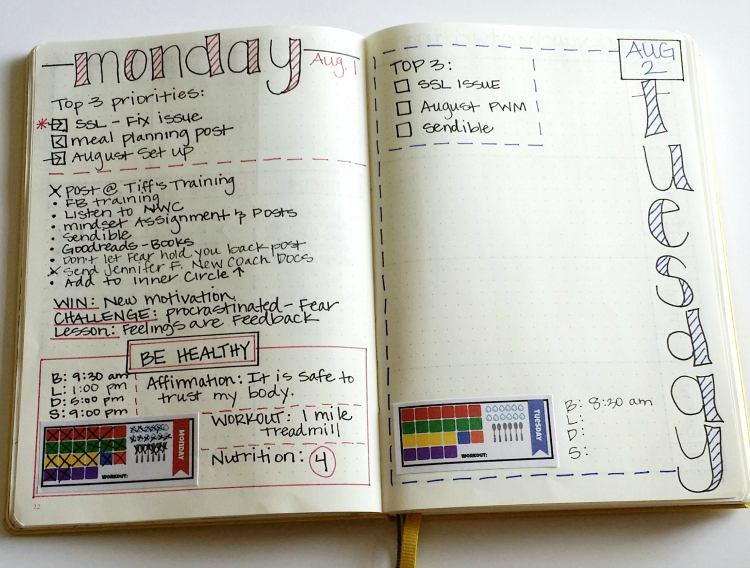 So if I spent any time at all trying to make my BuJo look presentable it would thwart the intended purpose of the BuJo — rapid logging and an accurate record without wasting time. 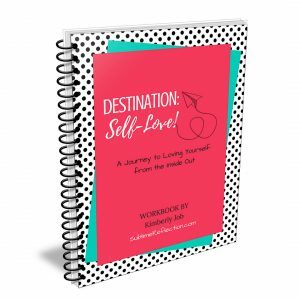 I’ve been following your blog and a few other BuJo bloggers and stalking your amazing photos on IG all summer. It’s been a rough summer ( terrible year really), my kids dad died at the very end of May, but had been dying since Christmas from colon cancer that returned after two years and metastasized to his liver ( he was only 50). All of 2017 has been extreme difficult. I stopped writing and working on my novels ( I know I shouldn’t have – he wanted me to finish then), but suddenly nothing else mattered except preserving what little tine my kids had left with their dad and making new memories. They’re in their teens and that’s such a difficult tine to lose their dad. I know – anytime is hard,, but at this age it seems especially hard. Once the cancer returned we just didn’t have long and it’s been a painful, arduous summer. I haven’t felt like being involved in social media. I haven’t been social at all, but I’ve followed many blogs, IG and Twitter posts and I’ve truly enjoyed learning from yours. Now that school is about to begin and my kids will be back on a regular schedule with classes and sports, I’m hoping to return to my blog, novel writing and other social media and eventually … one day even real life socializing … maybe. So I’m thinking this is a good. month to finally try out my BuJo . I’ve purchased quite a few items for beginners. I got the official BuJo notebook from Ryder’s website. I’ll get my next one from you. I love bright colors. I’m thinking, however, I might need to jump up the the largest Leuchtturm . I’m not sure of the measurements. I have one at home, it’s bright orange and I believe it’s called the Leuchtturm 1917 – it’s hard bound – dotted with about 125 numbered pages and an index. No key. I have horrible handwriting, I wasn’t kidding. I don’t know if I can get enough on the smaller pages to make it worthwhile. Perhaps the purchased stickers will be beneficial. P/s let me know when you carry them and other items in your store. Sorry this is such a long comment. I’ve been reading your posts for so long (lurking –LOL ) & decided to start saying hello to the BuJo writers that I read and it appears I had a lot more to say than I realized. I’ve been away too long. I really adore your blog. Informative, fun and creative. Oh, I love your Instagram growth tracker! So much prettier than just the plain follower numbers. I am so glad I found this post. I have so many things I want to accomplish and I get so scattered because there are so many things. 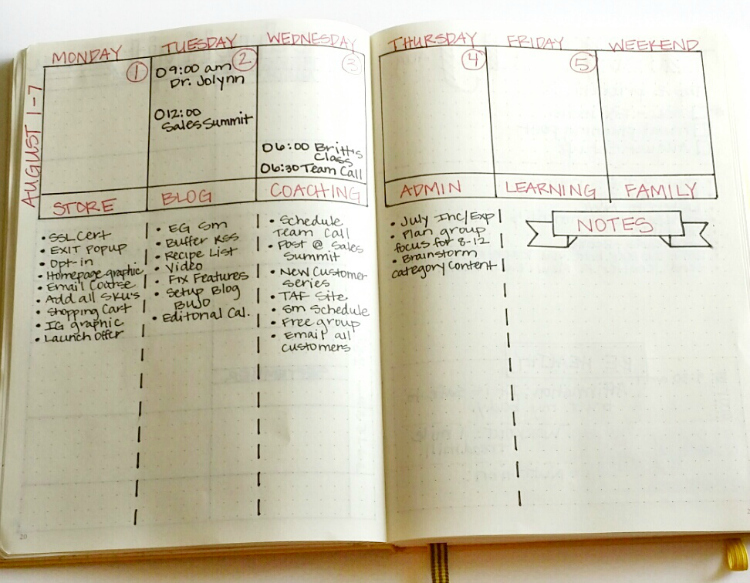 I love this idea of picking one work item and one personal item to focus on for 90 days. I have my spread mocked up. Now I need to fill in my specifics. I have a question. 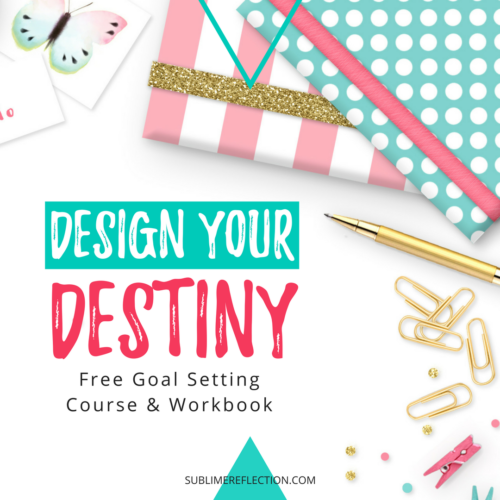 When thinking about my business goal one came to mind that I really SHOULD do but I haven’t wanted to do it for many years now. What do you suggest – make myself make this a priority for 3 months or choose something that would be more fun and also result in moving myself forward?